Last year, Washington State did a study to find out ways to decrease motorcycle fatalities in our great state. What they found out was that there were three major factors contributing to motorcycle fatalities, excessive speed, alcohol and lane errors (running wide in corners). These findings are consistent with the recent study done in Oregon and by the U.S. Air Force. 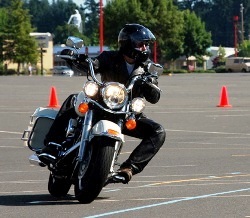 Puget Sound Safety has taken this information and looked at what skills were missing in these accidents involving riders and are developing an Advanced Street Skills course to master those skills at real world speed. This training is not done in a parking lot, but instead will be held at Pacific Raceways where cornering skills can be honed at real life speeds. It is not a racing school open to the public but instead a ground-up development designed for "real" street riders, riding what they ride on the road� cruisers, sport-tours, touring bikes, even sportbikes. Let's face the fact here - most of us spend most of our time on the public roads so why not practice with what we ride on the road. The track provides a controlled environment for riders looking to improve their cornering and riding skills, not learn how to win a race or shave 1/10th of a second off of their lap time! Since it is now clear that we are our own greatest hazard, let's all learn how to corner SMART � Scan-Mark-Adjust-Relax-Throttle. As you progress through the course you will be taught each of these steps in greater detail followed by drills to help each of you hone and perfect your cornering. So here is a preview to what SMART corning is all about. Before we can commit to any corner or select a line through it we need to scan for these two critical factors. This is the line that you visualize yourself riding� mentally draw the line through the corner that you intend to ride, marking your entry point, apex, and exit along the way. It is hard to ride a clean line when you don't know what line you are going to ride. It is better to commit to a bad line than to commit to nothing. Adjust your speed to an appropriate entry speed, one that will allow you to stabilize the motorcycle throughout the whole corner (remember one of the 3 factors in the study was excessive speed). One of the most common issues is a rider coming into a corner too hot. How many of you have entered a corner only to drop the throttle in the middle of the corner followed by a mouthful of expletives? After which you pull to the side of the road and promptly change your shorts! The whole event is then concluded by a lie made to yourself that "you'll never do that again". Better to come in too slow than too fast. Remember� slow in� fast out! The second step here is to adjust your position. First adjust your lane position to line up with the entry that you already marked mentally. This is also the time to adjust your body position if needed. Anytime you use body positioning for cornering it should be done well before the entry to the corner. Relax your body and grip� this is easier said than done and one of the keys to becoming a better rider. It is extremely common for riders to not relax their arms while cornering causing the bike to become less stable and turn in slowly. Press on the inside bar. To make this work properly you need to be relaxed. The key here is to relax the outside grip while cornering. Those who don't relax the outside grip while pressing on the inside are performing isometric exercises. The bike wants to turn in but the pressure on the outside grip prevents this from happening. Steady throttle� this works well when pacing a series of corners that offer full visibility. The drawback to steady throttle is that it leaves little room to decrease speed without negatively affecting traction and generally carries a higher entry speed. Trail braking� this is when we deliberately carry our braking into the corner. This is a good way to stabilize the bike but, just like using a steady throttle, it leaves fewer options to deal with the unexpected. We work on trail braking� also called throttle/brake transitions in the performance level of our Advanced Street Skills event and in the Total Control Advanced Riding Clinic. Throttle out� once you have apex'd the corner, add throttle to pick the bike up and out of the corner. It is important to control how much throttle you apply until the bike is completely vertical. If you apply too much too soon you might overwhelm the traction that you have and� well you know what happens next. Remember we are talking about street cornering so traction can be unpredictable. This is the conclusion to the "slow-in.. fast-out" theory of cornering. We will revisit each of these concepts and much more in greater detail as the day continues. So there you have it� a brief overview of SMART cornering: Scan-Mark-Adjust-Relax-Throttle. If you are interested in learning how to corner better on public roads and learn skills like how to read the road to determine traction and directional changes even before you see the exit, how to stabilize your bike in a corner, road perception and better street lines, then you will want to come out and join Puget Sound Safety at Pacific Raceways for the Advanced Street Skills event. Space is limited; each session has a limited number of spots to keep the track friendly and un-intimidating, and since 2007 is the first season for the A.S.S. event, Puget Sound Safety is offering a special introductory rate of only $225 for the entire day!